It was a week like no other at the National Library of Medicine. For five days in May, people brought their family treasures to NLM to learn how to protect and preserve them. They came with photos, books, a family Bible, an American flag too old to have 50 stars, and an evening gown worn in the 1935 Miss Universe Pageant. 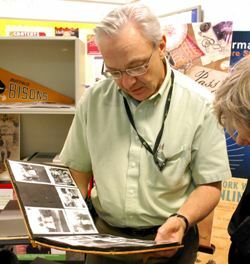 The unique show-and-tell was the Library’s first celebration of Preservation Week. It was so popular organizers already are thinking ahead to next year. The American Library Association created Preservation Week to highlight what can be done to preserve belongings whether in a library, museum, or home. The NLM event was organized by a team including Cybulski and Atalanta Grant-Suttie in the Preservation and Collection Management Section and Holly Herro and Kristi Wright Davenport in the History of Medicine Division. With so much preservation knowledge at NLM, organizers easily were able to put together a week’s worth of activities involving nearly a dozen NLM experts. There were demonstrations on bookbinding, preserving and storing photos, prints, books, home movies, recorded sound, textiles, and much more. People from NLM and from offices throughout the NIH were encouraged to bring their prized possessions to learn how to protect and store them. Lines formed around the demonstration table. There was an enthusiasm and fellowship among the crowds. “Sometimes when a person would come to the table, everyone would gather around because they wanted to see what that person had,” says Holly Herro, who advised several people with particularly unusual items. Michele Hindi-Alexander, PhD, a scientific review officer at NIH, brought perhaps the most talked-about item. She wanted to learn how to take care of the dress her mother wore when she was Miss Egypt and won the 1935 Miss Universe Pageant. “I just opened the plastic bag I’d been keeping it in and everyone went ‘Oh my,'” Hindi-Alexander says of the dress. “It’s part of our family history. My granddaughter is so interested in it. I want to make sure she knows the history.” Hindi-Alexander says she ultimately would like to donate the dress to the Bibliotheca Alexandrina, a library in Alexandria, Egypt. Herro showed Hindi-Alexander several ways to store the dress (a plastic bag is not a good idea), told her what types of non-damaging tissue paper and protective storage products to buy, and suggested a few sources where she could find them. Hindi-Alexander also got advice on how to preserve the scrapbook her grandfather kept with photos and newspaper articles about her mother. Herro also helped a woman who brought in an American flag that belonged to her great, great grandfather. 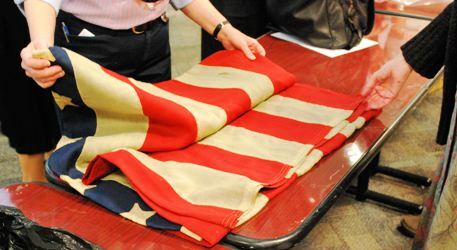 Herro spotted a marking on the flag that the woman didn’t know was there—it was her great, great grandfather’s name written in iron gall ink on one of the stars. And, Herro carefully opened a family Bible that hadn’t been opened in decades because the owner was afraid to touch it. “People were just gasping as I turned the pages,” Herro recalls. That’s because she uncovered a lock of hair, photos and family records the owner hadn’t seen before. The Preservation Week team members shared their wisdom with visitors and directed them to Web sites where they could contact experts for further information. The American Institute for Conservation of Historic and Artistic Works (AIC) Web site has a resource center with information on finding a conservator and caring for your treasures. “When you are young you tend to toss things or stick them on shelves or in closets. As you get older you realize the value of this heritage and think ‘I’ve been mistreating this,'” notes Susan Permut, a Web site Manager at NIH. She got help finding someone to repair her 1940s leather-bound edition of Lust for Life, the novel about artist Vincent Van Gogh. People attending the event were pleasantly surprised to learn about all the preservation work that takes place at NLM. And they were surprised to learn that a lot of the materials they could use to protect and store their belongings can be found in craft stores—items like acid-free paper and plastic sleeves that pass the photographic activity test. Preservation Week visitors say they were thrilled to get the advice. And the people who worked at the event say it was a satisfying and exciting experience. Editor’s Note: Future articles on preservation are planned. Stay tuned for a look at how conservators care for the NLM collection; how they prepare for fire, flood and other disasters, and react when those things happen; and how you can protect your cherished books, papers and other personal items. Top Photo Caption: American flag photo by E. Déshaun Williams. 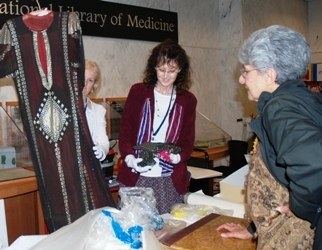 Middle Photo: Michele Hindi-Alexander, PhD talks with HMD staff about a gown worn in the 1935 Miss Universe Pageant. Photo by Valerie Lambros. Bottom Photo Caption: Walter Cybulski views photo album with a visitor. Photo by E. Déshaun Williams.